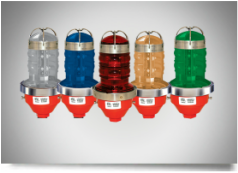 The all LED Class I, Div 2 Dialight Medium Intensity White Strobe and Red Beacon is designed for lighting of chimneys, flare stacks, and any other types of obstruction to aviation in hazardous areas such as power plants, refineries and chemical plants. 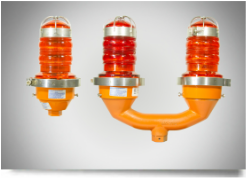 LED Based L810 Red Obstruction light certified to meet both the rigorous FAA requirements for red LED obstruction lights and Class I, Division 2 and ATEX certifications for hazardous area lighting locations. It is available in 120 or 230 volt versions and can be ordered as single or dual units. 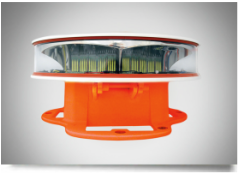 Dialight's steady burn LED Based Class I, Division 2 and ATEX approved Visual Signals are used in a wide range of industries for visual indication in hazardous environments. Versions of this fixture are available in 120VAC or 230VAC. 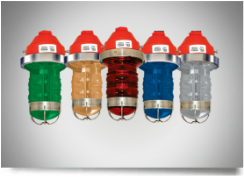 Dialight's newest addition to their line of Class I, Division 2 Visual Signal Lights, the FLS Series Flashing Signals are used in a wide range of industries for visual indication in hazardous environments. Versions of this fixture are available in 120VAC, 230VAC or 12-48 VDC. 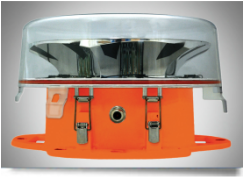 The Dialight SafeSite® L-864 Red LED Medium Intensity Beacon utilizes state-of-the-art optical design to achieve the most compact, efficient, FAA compliant L-864 device in the market. While it readily interfaces into existing installations, its robust, low power design will provide years of maintenance free service.